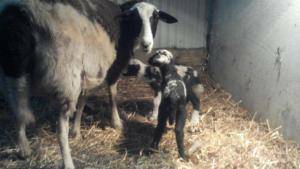 HomeBlogMisty Lane Farm BlogsIt’s Lambing Time! We are still in the middle of lambing. Only two sets of twins so far, but the lambs are doing great and out with their ewes on grass, tails a wagging in the sunshine today. 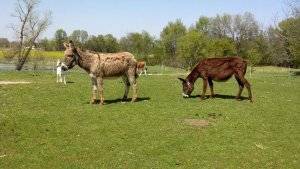 This month we added a pair of jennies, 8 & 9 year old female donkeys to help guard the sheep. Their names are Dorothy (grey) and Velvet (black/brown) and have been bred to a spotted jack, due 3/13. Here’s a photo of a our first ewe to lamb with her first set of twins too. We’re naming new lambs after ice cream flavors this year. The two pictured are named oreo and moosie (moose tracks), we also have a vanilla and a swirl. Short post this time, weather’s too nice and we’re anxiously awaiting more lambs!